I’m not sure that raises anything new. As I said earlier, what happened was labour figures telling EM that the campaign could not be all about him but needed to include other senior figures. Press Preview commentator tonight named the Lab MP who has done the recording as none other than Simon Danczuk & if that wasn’t the first name that springs to mind in any criticism of Ed Miliband from within the Lab party then you haven’t been paying attention. He & Graham Stringer are always whining & are best ignored, imo. On asking Lab voters as mentioned on previous page, there was a ‘Twitter storm’ this evening where people intending to vote Labour gave their reasons for doing so, using the #WeBackEd. Over 40000 tweets were posted using that hashtag so it’s surprising the press has ignored it given that so many of their stories originate from Twitter – or perhaps it isn’t so surprising after all. Thanks for the link to the Survation tables. 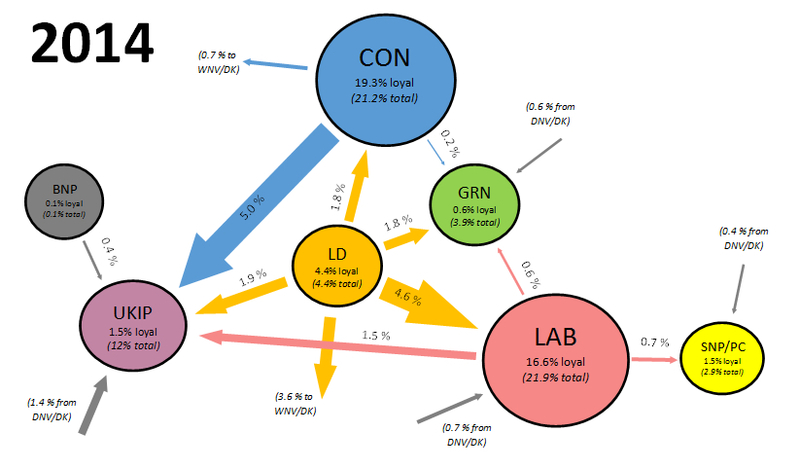 So now we can see how the Labour vote changes with each leader. Alan takes 5% of the Tory vote, 19% of the Lib Dem vote and 7% of the UKIP vote. Chuka is rated worst on immigration, best on economy. Yvette is rated best on cutting welfare, worst on jobs. Yvette loses 6% of Labour voters to Lib Dems and 3% to UKIP and 1% to the Greens. 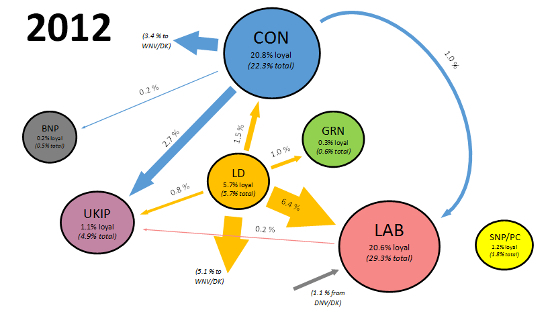 6% of Lib Dems move to the Tories, and 3% of UKIP goes to the Tories. Obviously small samples in each case, and it is not possible to see how much personality vs policy impression influences switches, but it was interesting seeing how a change in leadership in one party results in voting intention switching in two completely unrelated parties. Pity we didn’t have Ed Balls in the list, and it also wasn’t clear how much the chosen video clips influenced the result, but at a high level it seems different leaders have clearly different strengths, and a team approach with each leader playing to their strengths would work better than expecting one person to do it all. Dilnot is on the Daily/Sunday Politics. Before that, he was a reporter in Sussex .. and, I hesitate to mention, was exploded in effigy by a Lewes Bonfire society. Where’s the full figs for you gov? That survation poll would still deliver more lib Dems than ukippers – haha! And also noteworthy was that Chuka is rated worst on immigration (The number 1 issue for voters according to polls), but his supposed economic competence and other personal characteristics meant the Labour vote share still increased. And that Andy Burnham who is rated best on the NHS, with the NHS the second rated issue according to voters * ends up with a lower lead than other candidates. So not sure where that leaves issues lists. It looks like voters look at the overall package rather than just who is best on each issue. actually suggests to me that the actual complaint is another one of those calls for more prominence for other members of the Labour team in the media. MP demands to appear on TV more, who’d have thunk it? Mind you if it is Danczuk I wouldn’t be surprised as in this he follows faithfully in the tradition of his Rochdale predecessor, Cyril Smith, of whom it was once said that he reacted to microphones like a pig seeing a trough. Simon Danczuk, Labour MP for Rochdale, said in an interview to be broadcast on the BBC’s Sunday Politics today that “more Ed” was not the way for the party to win May’s general election. He said: “The answer isn’t more Ed in the next six months, let’s be honest about this because that approach has already been tried and tested. “What we need is a team approach, that’s the reality of it. That’s what David Cameron does – he has a team approach and it helps hide some of his weaknesses because he’s spreading the load across a number of Cabinet ministers. “And Ed needs to take the same approach because the numbers show us that he’s not popular with the electorate, that’s the reality of it. Indeed. I’ll be happy never to see a reference to an online website poll, or a Twitter hashtag ever again! It’s also worth pointing out that it’s easy to say that certain people should be given more prominence in the media. But, strangely enough, the media don’t always do what the Labour Party thinks they should and media coverage is not entirely at the whim of Ed Miliband’s leadership team. Something that more than a few seconds scrutiny of the London media in the last four years would make clear to anyone. It dates from when IDS (also at the time leader of the opposition) was dumped despite being democratically elected by his party. Except his treatment was a bit worse in that I think his wife was accused of claiming a fake salary for work she hadn’t done, and that was used to leverage him out. She was cleared after the event (too late to save him of course). The real reason they got rid of him was the same as now – lack of charisma and not connecting to the voters. They even tried the lack-of-charisma-is-an-asset defence (sounds familiar?) and IDS himself tried to articulate that in the quiet man speech (at least EdM has never given a speech that bad!). The pattern is the same: poor conference speech. Derision. Polls showing public implacably against warming up to him. Leader rattled and starting to make mistakes. Press excited because they scent blood. Leader despatched a few months after conference. The only difference is that the tories did it 18 months before a general election instead of 6 months. And the “democratically elected leader” thing didn’t matter one jot – pretty much everyone and their dog agreed that it was the correct thing to do – I think they still do. Politics is brutal. I think part of the problem is the media are under pressure to deliver clicks. A report about devolving bus routes or whatever the latest policy is, is not something that a journalist can really big up, or put a headline on that would encourage people to read it. No clicks= no advertising= no job. Now come up with some exciting controversial policies that everyone can gang up for or against and get a debate going and its a different story. But the problem is controversy is risky. Whether Labour wanted the current controversy or not, they have the media spotlight now. They should use it, but please no more bus route devolution. Typical poll we have seen of late, with the 3 traditional parties showing their recent weaknesses in the crossbreaks and Greens, UKIP and SNP showing their strengths. So that poll finding doesn’t help Lab decide what to do. A perfect result for the other parties – poor polling for Ed M and no one else can do much better. Today’s YouGov figures give EM disastrous figures for Scotland, worse even than NC’s. For Labour in Scotland a huge amount rests on the shoulders of whoever becomes the next leader of the Scottish party. I know wee’re not supposed to give personal views, but Boyack seems to me to be Labour’s best bet. Murphy is a ‘chancer’ in many people’s eyes, and has no working knowledge of Holyrood. Findlay, although a fellow clansman of mine, is not up to the job, although knows his way round the heartland. In general, Labour has the problem that shadow ministers are rarely quite as well-known as ministers; but it also has the problem that, in Scotland, several shadow and ministerial jobs have little or no resonance in the devolved situation. When a news article has nothing to do with you – e.g. health, education or local government, then those speaking on the subject rarely grab your attention. But Roger Mexico is clearly right too, However much things are reshuffled they won’t be heard unless the press report them, something it is not inclined to do. In this respect controversy may help as Richard said even if it is risky. Ed M is apparently going to speak to ‘business leaders’ and say that leaving the EU would be disastrous economically and talking about it is destabilizing. That’s controversial enough and it has the virtue of getting reported and splitting the right. What needs to go along with that in a team approach is that everyone should as it were pitch in from their angle and from their strengths. For example, in my ideal scenario Alan Johnson would immediately say that he hears the UKIP pain and emphasise all the stuff about gang masters, and minimum wage, and using the positives of EU legislation to make sure that we don’t rush to the bottom of a zero hour contract casual employment race. Andy B should say that the NHS would collapse without all those foreign nurses and doctors (everyone knows this is true) and if we had to cope with ailments of all our old people in Spain (they’re better off in the sun and we are wise to leave them there). And Chuk U should say that because of Labour’s wise decision to stay out of the Euro we have the best of both worlds, the ability to stay out of Eurozone Austerity and the fantastic opportunity to attract inward investment and export to a market of 400 million. And given a little time I’m sure that everyone can think of lines for Yvette Cooper and all the other hopefuls and of things that would appeal to the Greens (you can’t tackle climate change on your own) and the Scots (nor can you deal with fish stocks on your own). And because everyone was falling in behind Ed M, he would suddenly and miraculously start to look like a leader. And perhaps the press might notice this. And even if they didn’t there would be column inches on UKPR and you can’t get more influential than that. @…………………………………………… And even if they didn’t there would be column inches on UKPR and you can’t get more influential than that. That post says everything you need to know about UKPR these days. I think that limiting Scottish interest to fish stocks may be being a little simplistic! What is quite clear from up here is that the constitutional question is rather important and Labour ignores it at its peril. I agree that there is much Labour could say positively, but telling people that things would be even worse if we were in the Eurozone is not going to win many friends IMO – even though it may be very true. In any case, had we gone into the Euro then I believe that would have altered the economic approach – we would have been a stronger counter-balance to the Germans – and the Eurozone would not be in quite the mess it is now. But then, that’s not a popular line either……. Balls must be clearer on how the deficit/debt is going to be handled in a way which does not involve a continuation of the present austerity line. But what can Labour say which will keep everyone on board? And increase support? Very difficult. And how influential do either of you think UKPR is? Do the leaders of the various parties log in regularly to pick up handy tips on what to do next? The best thing the Labour Party could do is point to a council they run and show how well off everyone is there. 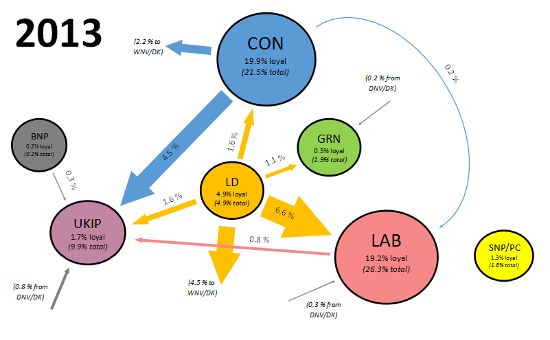 I have reviewed the VI figures for 2014, and it does not look pretty for the main parties. While the current anti-Ed headlines are largely politically motivated, I think there is a generational existential crisis among the mainstream parties. The Conservatives by the end of November will have lost two MPs and two seats to UKIP. They stubbornly trail Labour despite Labour having a very publicly unpopular Leader, and barely any positive news coverage. Labour’s VI remain steady, but lower than they would like (or probably need). Support is leaking all around. Ed is facing a merciless onslaught in the media, and it will be hard win back true ‘PM in waiting’ credibility. Labour’s Scottish dominance looks to be peeling away to the SNP. The Lib Dems have been walking their Green Mile since the end of 2010, and nothing has changed. Given this, is it any wonder that MPs in these parties are getting really twitchy? I fully expect the the current Labour crisis of confidence to spread to the Conservatives after a probable by-election loss. Too many MPs will be looking down the barrel of a UKIP driven defeat to just sit back and be calm. Of course, all this could unwind back to business as usual, but that is looking less and less likely the closer the election is. The best placed people will be those selling valium to Westminster. Things have got a little worse for the LDs recently. They were considered to have a “nailed on” 10% for ages, and are now most regularly on 6s and 7s. @Floating Voter – Somehow i doubt whether any email from me would get beyond the first tier of Ed M’s defenses. i post on UKPR a) out of self-indulgence and to take my mind off things b) to get instruction and feedback (which I do get and for which I am grateful and c) in the probably vain hope of influencing Amber and other luminaries whom I regard as both better informed and much more influential than myself. This latter is part of a wider project of carrying on things that were close to my wife’s heart and is in intention altruistic. I’m really not sure defending immigration is needed. All the polls suggest skilled immigration is largely welcomed and Ukip is not calling for repatriation. Getting away from silly statements such as ‘immigration is a good/bad thing’ or ‘immigrants are most likely to be this or that’ is key. Does low skilled immigration benefit Labour’s core working class vote? If not, then defending skilled immigration won’t help. I’ve advocated the team approach in every election since 1997, when Bambi sailed serenely into No 10 after years of everyone else paddling furiously. Blair was confident within his team, and they all knew the plan. The voices of disgruntlement have been there for some time now. It all has to be Ed (the more people see him the more they will warm to him etc). He doesn’t communicate, even shadow ministers don’t know the plan or when announcements will be made, and so on. Whether he can change his leadership style remains to be seen, but he’s been given a rocket anyway. Perhaps Ed has realised ‘you can’t out UKIP UKIP’ and has made a strategic decision to avoid that route. Bear in mind strong anti-immigration rhetoric is toxic to many left leaning voters. Was at a firends 50th birthday party last night and all any one talked about all night was Ed Millibands woes. Not really, I lied – sorry. So far tthe press have not managed to make the story significnat enough to reach atypical voters imo. Unless they can get a genuine senior figure (not a discredited ex nu-Labour type) or a critical mass of MPs (which I doubt) i genuinely think this will blow over. Verdict so fat, Mildly damaging but potentially helpfull if we see more of other spokepeople and they connect better with key swing voters. And also that to get to a point where you would be polling on a real new alternative leader rather than a series of hypothetical choices the Labour Party would have torn itself apart in a bout of internal warfare, the likes of which we probably wouldn’t have seen since the start of the 1980s. I defy any polling company to factor that in to a poll that can truly measure the impact of a change at the top. Wjhen considering the Survation poll bear in mind that it instead puts forward a series of pen portraits to try and guide perceptions of alternative leaders. The portraits of the alternatives are about as flattering as you could dream up of each, except for one who we are told is the son of a “marxist academic” (rather than say a “war veteran and refugee from the N***s”) and while mentioning Oxbridge doesn’t mention that he managed to get there from a comprehensive school (and I’m not talking about Andy Burnham). It’s as though it were designed to create a headline. Ed badly needs a gurning free day. The photographers have all lenses on him at the Cenotaph apparently. He has to be strong at a crazy time like this. Definitely don’t wear a donkey jacket! So Pressman was right all along. Concerted Autumn attack in full swing . It’s utterly pointless complaining about the media, you work with what you’ve got. Leave them with nothing to do and they’ll start to make it up. Schedule a varied roster of events, speeches, announcements (hand round bits of paper etc) and they’ll turn up just to be able to be seen bumping into their chums. What I read into that speech is that Labour/Miliband have decided on an approach that tries to show that it’s possible to take reasonable and concrete steps that go some way towards addressing public concern about immigration while trying to decouple this from the issue of Britain’s continued membership of the EU. A focus in particular on tackling migration in order to try and combat the scourge of low pay is not going to put off left-leaning voters. You can’t outkip Ukip but Labour also can’t beat the Tories on the economy. Ed can’t ignore these two huge concerns and give up. Blair is his blueprint. Borrow ideas explicitly on weak areas, and then exploit stronger areas, e.g. fairness, NHS etc. Immigration needn’t be toxic or racist and, as only 6% want an increase, it appeals to most centrists to address it. Ed ignores it at his peril (personally I think he has broached it but is forever being let down by mavericks like Abbot, time bombs such as Blair and, quite rightly, history of the previous Lab administration). Sunday Herald this morning giving a figure for Scottish Labour membership of 13,500 up 1,000 tpsince the referendum. It quotes that as a sixth of the SNP which it puts at 84,000! I am not sure that that is correct, as they might have taken the 65,000 membership figure and thought it was the new member figure and added the two. It puts the Socialists up 1,000 to 3,000 (+50%) and the Greens doubling from 3,500 to 7,000. No figures for Tories or LibDems and we don’t know how many of these members will actively campaign in the Westminster elections. The logic of increased migration leading to low pay is something I do not accept, and I’m sure I’m not the only one. I believe the issue of low pay is one of an inadequate minimum wage, it’s poor enforcement and employment practices . Blaming migrants for low pay is wrong in my view, so a line tackling migration to combat low pay is one that turns me off for one. If people are complaining about the EM coverage, then goodness me they should wait for the run-up to polling day. I have said before, it will make 92 look like kindergarten. If EM wins despite [the newspapers’] vilification a go way to raise new revenue would be VAT on newspapers! If he announced it as policy now he could even dismiss all [their] attacks as being a Press Baron attempt to prevent paying their fair share! Vernon Coaker must be a little disappointed that only 19% say that they have heard of him – and they probably include the 15% who had heard of fictional politician Andrew Farmer. Charts updated folks. Some nice stuff going on today, and the thirty-poll charts’ last data point is a full thirty. – Miliband’s leadership ratings at an all-time low in Scotland at minus 72. – Conservatives seven points ahead in the Midlands. – UKIP on 21% in RoS. – Conservatives’ Scottish VI slips for 4th month in a row. – UKIP up approximately 4% in all parts of the UK (except Scotland – down a fraction) over the last three months. And finally – Miliband and Clegg set to slog it out for least popular leader, while Cameron’s M&W rating hits a positive value. The Ed Miliband story is ridiculous. I can understand Pressman and his friends running with it – but the left leaning press should know better. There is no mechanism in the Labour Party rules that would allow Miliband to be deposed prior to the GE. & A guy that wrestled the leadership from his brother must have very strong convictions. He is currently on course to be PM why on earth would he give that up. The Cons are the ones with the real issues 29/27 in the polls, a poor by-election showing, and the EU bill fiasco. The media and the BBC have lost their grip on reality.